Leaking oil during shipment can result in delays. Pumps: rotate the pulley/shaft to push oil out of the pump housing. Remove the cap and allow the reservoir to drain overnight. MANUAL gearboxes need NOT be emptied. Ship gearboxes and pumps in separate boxes to avoid damage to your pump's thin metal reservoirs. Pump pulleys can be easily damaged in shipping so pack them accordingly. Your component is checked-in and a work order is created. We email (or call) you with the work order that describes the work to be performed and the cost. If there are questions, we get them resolved up front. Poorly packed parts can result in shipping damage. The key to minimizing shipping damage is keeping the component tight in the packaging. If its loose, shifting around occurs, the box gets punctured and something is damaged or bent. Keep scrolling to see examples of good packaging practices. Pulleys are easily bent when poorly packed. 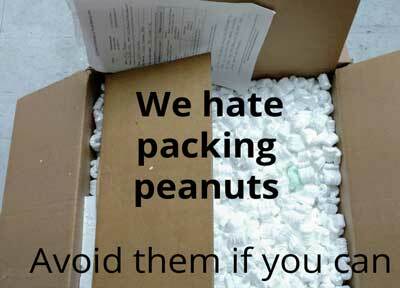 Box-in-a-box packaging is one of the best way to keep your components safe during shipping. A tightly packed inner box for the component, nestled in a protective outer box. Below are examples of incoming packages we receive. Some customers use plastic storage boxes as an inner pack and taped them up in a similar manner as this inner cardboard box. Here, a customer bagged the inner box. This was a good way to keep the sharp edges of the component from cutting the plastic bag. Another inner pack. Was it a gearbox or a frozen turkey? It was a well padded gearbox. Another inner pack example - it doesn't have to be pretty.